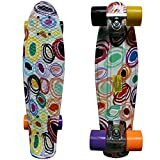 If you have just started to longboard, you must be in search of a longboard that is both cheap and will stand your wrong moves. Also, you want a longboard that’s easy to control, right? Whatever is your requirement, Quest has thought of it all. 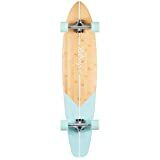 In order to help you with your beginning rides and the confusion about if you should or should not buy your own longboard, it has introduced the Super Cruiser Artisan Crafted Longboard. However, this board is perfect for experts as well.Our aim is to give you a better idea about this cheap masterpiece through the Quest Longboards Review. So, hang on and you will know if this is the longboard your mind and heart have been looking for. Super cruiser Longboard is, in fact, a very long board. If you are shorter than 5’6 feet than you should look for a shorter longboard because this longboard is 44 inches in length. It weighs 8.2 pounds so is quite easy to carry around the neighborhood. However, it’s best to ride it. The high-quality and lightweight materials are what makes this longboard so worthwhile. The smoothness of the materials used makes the longboards performance smooth as well. Hardwood maple and artisan bamboo are what constructs the deck. This makes the deck quite stiff as a result you get a better balance but a lesser feel standing on it. Consequently, the materials used to make this longboard is very durable and a good ride. As the deck and the size will mean nothing without good pairs of wheels, let us get onto it. Polyurethane constructs the wheels that have a diameter of 70 millimeters. Also, these are provided with good-quality 4mm risers. In fact, this riser help to decrease the impact on the whole longboard by taking in the shocks themselves. The 80A durometer of the wheels is connected to the trucks through Precision ABEC bearings. With the right combination of speed and acceleration, this strong durometer makes your ride better. In order to provide you with the smoothest turns possible, Quest has made the trucks 7 inches long. Moreover, the trucks being made of aluminum are quite durable and will perform efficiently. Therefore, you are assured that the wheels will do their jobs well. And, you, my friend will have a great time maneuvering through the twists and turns. Well, if you are a beginner, we know exactly how much the looks mean to you. Again, if you are an expert, it might mean less but you won’t like to have an ugly longboard either. Fortunately, this longboard doesn’t disappoint in case of looks either. It does not have a deck that catches people’s eyes while you are gliding as its plain black. However, it’s not that simple either, the plain black look does not look quite plain because of the stylish, catchy red logo that sits on it. This marvelous longboard is specifically designed with features to make your initial practices easier. The experts will also find it easier to control. You can even take sharp 90 degree turns without any worries with this board. Moreover, you can ride fast, ride slow or carry it around in your hand, and it will suit the role! In order to make your rides even better, Quest has added a high-performance reverse Kickpin configuration. With this feature, you can use the longboard to do any trick you want to. If you want an easy to move longboard that can take quick and sharp turns, this is definitely the one for you. Therefore, this longboard is great for cruising or commuting. Comparatively cheaper than most longboards. Made of eco-friendly, durable and top-notch materials. The great construction of the wheels helps to save the longboard from greater shocks. Long and detailed trunk makes the longboard suitable for swift and sharp turns. Extra Kickpin feature helps the rider perform tricks easily. Looks great with a simple yet not too simple design. Sturdy for others but lightweight itself. Shorter and younger riders might find it too long in length. Bearings are not very durable. Will the board be able to carry a rider weighing over 235 lbs.? Answer: Yes, fortunately, it can. The board’s durable, sturdy materials and tactful build makes it qualified to carry heavy weights. Not just 235, it can carry at least 290 lbs. without any problems. Is it good for a 9-year old kid? Answer: Yes, the kid is unlikely to face any problem while riding and turning it. As the board is very easy to maneuver. Also, it’s safe for use as the durable material makes it rare for snapping. However, the length of the board might be a problem if your kid is very small in size. Because the longboard is quite long and handling such a longboard might be tough for a kid. Is it really heavy to push? Answer: Nope, it’s not very heavy to push. A person of 5.4 feet will face no difficulty pushing it. However, as the bearings are not very durable and efficient, you should buy new bearings to get smoothers and even better rides. The Super Cruiser longboard is a combination of durable, eco-friendly materials, sturdy build, classy design and favorable features. And, all this at a very cheap price. What more could you ask for? Therefore, if you do not want to spend much or get hurt but still want to glide and have fun, this longboard is definitely the one for you. However, in the end, it is you who have to take the decision. If it does not suit your height or style, it just doesn’t. Do not go for it then. 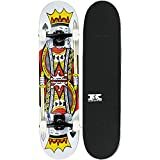 Our aim was to let you know everything about The Super Cruiser through this Quest Longboards review and we think we did. Hope you got what you wanted!